The exquisite niece of Lord Edward and Lady Charlotte Malory, Regina Ashton is outraged over her abduction by the arrogant, devilishly handsome Nicholas Eden - and is determined to make the rogue pay...with his heart. A golden-haired seducer, Nicholas has been hardened by a painful secret in his past. And now that he has besmirched Reggie's good name, the hot-tempered lady has vowed to wed him. Her fiery beauty stirs Nicholas as no woman ever has - and the rake arouses Reggie's passion to an unendurable level. Such uncontrolled desires can lead only to dangerous misunderstandings...and, perhaps, to a love that can live only once in a lifetime. I love Joanna Lindsey. This wasn't my favorite of her books but it's definitely worth the read. Lived this book and I am sorry I did not read it before I read the other books in this series. But I say read it you will enjoy it. The best narrator!!! I already loved the book, but with exceptional narration added it's even better!! I love Regina Ashton's character; because she is so smart... I also love our narrator Laural Merlington especially all the voices she made. 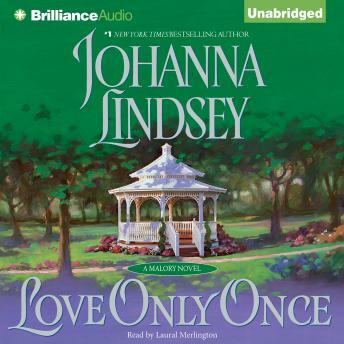 I am a HUGE Johanna Lindsey fan. This was not one of my favorite books out of the several I have read, but I enjoyed it none the less.